The Sounders academy won the U16/17 national championship earlier this month, giving fans and the front office alike a potential glimpse into the club's homegrown talent of the future. Moses Lake teenager and budding soccer star Ray Serrano wasn’t about to argue with his roommate over who controlled the television remote, or got the most comfortable bed. When you’re only 15 and sharing a pad with Sounders center back Roman Torres as a guest invitee at the team’s training camps in California and Arizona, you do more listening than talking. A year earlier, another prized Sounders youth academy teen, Azriel Gonzalez, also 15, had lived out a similar version of fantasy soccer training and traveling alongside Clint Dempsey and Cristian Roldan. Nowadays, Serrano and Gonzalez, who’ve since signed professional contracts with the Sounders, led their academy to a U16/17 national championship win over their teenage development program counterparts from Atlanta United FC earlier this month. Serrano scored twice and Gonzalez once in a 5-1 rout, which has senior Sounders brass very excited about what their youth pipeline could mean at the Major League Soccer level a few seasons from now. Lagerwey has taken heat this season for the slow start of the MLS version of the Sounders. Stumbling starts requiring strong finishes have become a hallmark of the Lagerwey era during his first three-plus seasons reshaping the team and winning a championship along the way. But beyond the MLS level, Lagerwey’s other major undertaking was overhauling the team’s development program into a self-sustaining feeder system from the academy ranks through the pros. The biggest change was integrating the best young prospects, like Serrano and Gonzalez, alongside professional players from the Sounders FC 2 (S2) side in the second division United Soccer League (USL) and even the MLS team itself. Where the team had uncovered local gems like DeAndre Yedlin and Jordan Morris in years prior, it was more from happenstance than any systematic undertaking. Now, academy players – in a program overseen by director Mark Nicholls, are taught the same possession-based system and style of play as the MLS club and get to work and train alongside them. Their U17 season now done, Serrano and Gonzalez are headed to play in the USL for S2. Since Serrano’s actual parents originally hail from Mexico, he and Torres spoke Spanish inside the room and got along fine. Serrano quickly found himself soaking in advice from Torres and others like boyhood idol Dempsey, whose poster still sits on his bedroom wall back in Moses Lake. 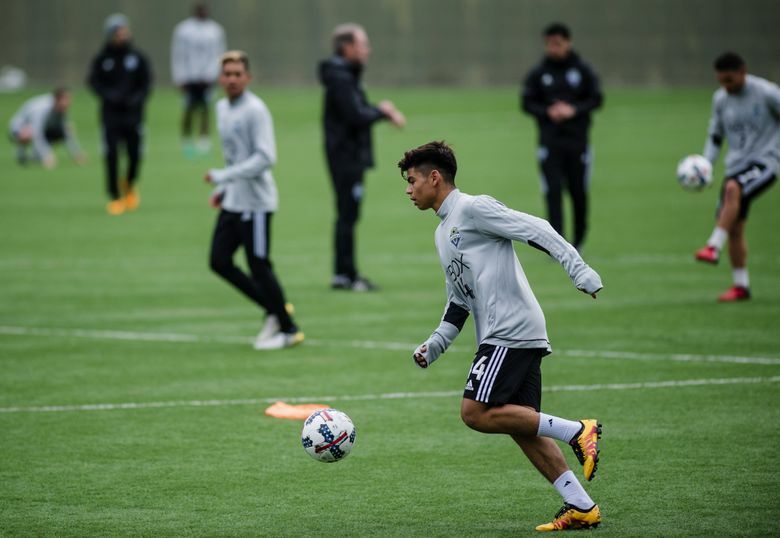 For Gonzalez, now 17 and in his third year within the Sounders system, the experience training alongside pros has also upped his game. He’s now done two stints at Sounders off-season training camps, where he’d watch the work habits of Sounders players – how they’d eat and conduct their day-to-day business. He’s since tried to “become a more professional player’’ by incorporating those same habits into his own routine. He’ll stay late after practice to work on things, or grab a salad instead of junk food when hungry. Academy players’ families often must sacrifice to get players like Serrano and Gonzalez the opportunity to do this. Las Vegas native Gonzalez joined the team’s academy at 13, living with a cousin in Renton. His mother, Sandra, two brothers and a sister later joined him while his father, David, remained behind for a year to sell the family’s home. Finally, his father joined he family as well. After working part-time construction jobs, he now has full time work, and Gonzalez says things have finally stabilized. Serrano’s family remains in flux, his mother having moved here to Graham, Wash., with him while his dad remains in Spokane for now. The plan is for them to reunite soon at a new place in Kent. Alongside teammates such as Alfonso Ocampo-Chavez and Alec Diaz, Serrano and Gonzalez helped their Chris Little-coached U17 side go 27-3-3 with a plus-81 goal differential during the regular season before cruising to the organization’s first academy championship. Atlanta actually scored first in the title match, but Serrano quickly equalized with his first of two goals while Gonzalez, Ocampo-Chavez and Diaz potted the others. Gonzalez already has played for the U16 national team, while Serrano has been a repeat invite to U17 training camps. With the 2026 FIFA World Cup scheduled to be played mostly in this country, it’s possible local fans are getting a preview of players who could become part of the U.S. team’s new generation. For now, Sounders GM Lagerwey will be content if the U17 players he now has in the system can save the team some money in future years. Importing a targeted allocation money player from overseas costs $500,000 and up while homegrown players are just a fraction of that. And with Major League Soccer getting more competitive by the season – as the Sounders have learned the hard way at times this year – any edge they can find will help.